Amongst the treatments that render a surface water repellent it can be useful to distiguish the treatments that form a tight, non porous film from those that form very thin molecul layers on the surfaces of the solid parts of the material making them water repellen. In general, water repellent substances “like” organic solvents: in practice, if a drop of an organic solvent is put on a water repellent but porous material it will be absorbed into the porosity by capillarity. 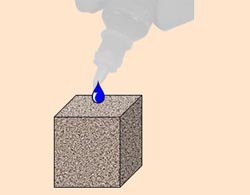 Hence, to find out wether a water repellent surface is porous or not, it is adequate to make first the water drop test described in the previous trick and then the test with a drop of ethanol whos explanation follows here after. 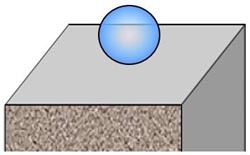 – if the pores of the materials surface are clogged, the drop of ethanol will wet the surface and spread but not be sucked in (b). Gradually the drop will disapear by evaporation (Caution: if it is very warm or windy this drying of the drop can be very fast).